Comets are icy objects that orbit the Sun. They can be as small as a large boulder or be many kilometres wide. If their orbit brings them close to the Sun, the heat of the sun will make the ice of a comet sublimate (turn into gas), creating beautiful tails. Great comets that shine brightly are rare, but at any given time many comets can be seen with telescopes. There are several binocular comets most years, which can be seen for a few weeks. Many web pages give details about future comets. This Aerith.net website lists comets visible in the evening, midnight and morning night skies. This website lists comets by magnitude (brightness), with the brightest at the top of the list. The Aerith website lists comets in order of magnitude. From a dark rural place, magnitude 6 stars can be seen. In light polluted cities, it can be hard to see even brighter magnitude 3 stars. The second brightest star in the sky is Sirius at magnitude -1.4; the Sun is -27. Comet light is spread over an area so even a bright magnitude 2 comet often requires binoculars, especially near cities and close to sunset. Comets are often brightest when close to the Sun, so frequently the best view is soon after sunset or just before sunrise. The Aerith website also has graphs of observations of comet brightness. Comets are very unpredictable. Planetarium apps for cell phones and tablets such as SkySafari and Starmap show the stars and planets for any date and time. They can show a wide view of the sky or zoom into a small area. They have a night vision feature that turns the screen red; helping your eyes to stay adapted to the dark. You can search for any celestial object of interest. Then use the centre feature, to lock the comet on the star field. Astronomers, both professionals and amateurs continually discover new comets, so an automatic update feature is useful. The higher priced versions of these apps have more objects in their databases. Comets have low surface brightness. It is hard to see comets against a bright sky such as just after sunset and in light polluted areas. Some devices have GPS and direction sensors so when you point to the sky; you see on the screen the stars in that direction. Turning the device to put the comet in the centre of the screen tells you where it is. That helps find where to point binoculars. Sometimes the compass feature needs adjustment. Check it on a known object such as the Big Dipper. Cell phones and tablets are great to use under the nigh sky. Inside, you can use free planetarium software like Stellarium to find your way around the sky. Comets get brighter as they get closer to the Sun and/or closer to Earth. There’s a general pattern, but many comets surprise by being brighter or less bright than expected. Periodic comets orbit in less than 200 years. The comet 2P/ Encke is named because it was the second periodic comet to have its orbit determined, and Johann Franz Encke, a 19th century German astronomer did this determination. Comets are now named after their discoverers, not the calculators of their orbits. 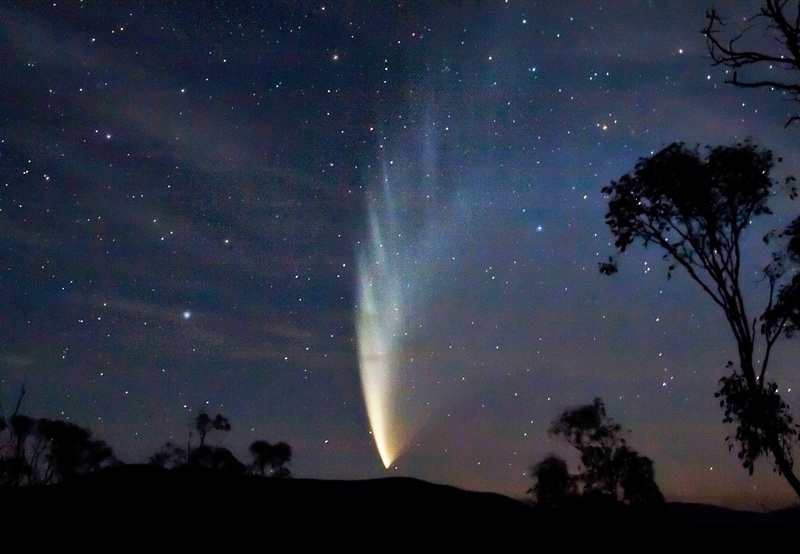 Long period comets take more than 200 years to orbit and come from much further out. Comet C/2012 S1 (ISON) was discovered in the 2nd half of the 9th month of 2012 (September 21), using telescopes belonging to the International Scientific Optical Network (ISON). Comet discoveries are subdivided by two-week intervals through the year and assigned a letter, where "S" stands for the latter half of September. So ISON was the first comet to be discovered in this period. Many magazines run articles on comets which are visible during the month of the issue. SkyNews is a Canadian magazine and comes with RASC membership. Sky & Telescope and Astronomy, are published in the United States. Photography: Few things in the sky are more beautiful than comets. These sites give suggestions for capturing images of them. click to inspect this insightful PDF guide. The German website Cometchaser.de gives many techniques to process photos to better show comets. Comet Data: Astronomers define comet orbits by 6 numbers or elements. The Jet Propulsion Laboratory website keeps track of orbits of comets and refines their elements as more observations become available. Often several comets have the same general name, so learn the 2-week designator letter of your comet as well as its name. This site also has three-dimensional simulations of the orbit. When someone discovers a comet, they report their discovery to the Minor Planet Center near Boston, MA. Their website gives the elements of all discovered comets. It can also predict the Ephemerides of a comet for any date and time. These give the location in the sky for the comet in terms of two numbers: right ascension and declination, which are the co-ordinate system for celestial objects.